Drama. Target is coming to Canada and the first stores with that brand will be opening by mid-year in 2013 (Reuters, December 9, 2012, Canadian retailers brace for Target’s cheap chic). The store’s retail format and goods are similar to those of the great British store, Marks & Spencer which closed its last stores in Canada in 1999 and the venerable Karstadt in Germany which was established in 1881 but emerged from a recent bankruptcy just two years ago and continues to struggle with retail shopping and consumer tastes (Forbes, December 9, 2012, Karstadt – Lack of Money, Excitement and Growth Equals a Slow Death). One could well ask of consumers, What do they want? and the answer (or process) is obviously very complicated and risky for both the consumer and the companies that they deal with. But when the shopping is done, consumers need to become investors else, eventually, they might not be buying much of anything at all. An “investment”, however, is just another “purchase”. It is the “purchase of risk” and like anything else that we might buy, we ought to know the price of it, that is, we ought to know the “price of risk”. The Gold Standard (in the absence of Consumer Reports™) is that as investors, we must be risk averse. We want our money to be provably “safe” and to obtain a hopeful return above the rate of inflation. Anything else – such as unearned and surprising or unfounded gains in the stock market – is provably just a gamble and unlikely to be repeated. Please see our Post on The Price of Risk, August 2012 and (for the Nobel Foundation) The Shire Green, December 2012, for more on the “nature of investing”. The Risk Price Chart (Exhibit 1 below) shows that we have been “entitled” (respecting risk aversion) to buy and hold the stock of Target Corporation in our Perpetual Bond™ between $35 and $58 in 2009 and early 2011 (Red Line above the Black Line, both of which are step-functions) and we hold it now since $58 earlier this year and $62 currently but did not buy it or hold it during the “volatility zone” (N) pricing throughout all of 2011 (the ambient stock prices appear to be at or below the Risk Price (SF)). 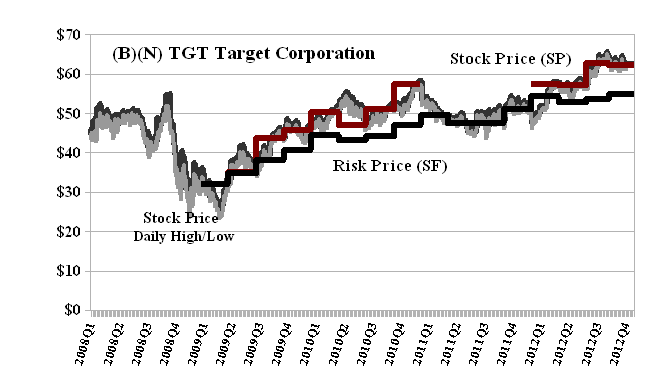 Target Corporation has a market value of $40 billion and pays a dividend of $1.44 per share or $920 million per year to its shareholders for a current yield of 2.3% which is comparable to the rate of inflation. Investors “like” it well enough (“like” is a technical term) to bid and hold the current stock price ($62) above the price of risk, Risk Price (SF), which has been steady to rising to the current $55. Stock prices above the price of risk are an “economic free good” and need to be earned to be appreciated and investors who are steadfast in the stock believe that they will be. Our estimate of the downside due to volatility is minus ($4.50) and we can, of course, “collar” the current price to lock in our gains if we want to keep the stock regardless of market conditions or near term volatility (please see our Posts, The Wall Street Put, August 2012 and Popoviciu’s Volatility, September 2012, for more detail). Target Corporation was incorporated in Minnesota in 1902 and operates in the three market segments of U.S. Retail, U.S. Credit Card Services and now the Canadian segment. Target is arriving in Canada at a time when most of the retail sector faces sluggish growth and many shoppers (according to retail analysts) can’t wait for the discounter’s debut and trendy items which, thanks to cross-border shopping trips, are already well known in much of Canada. 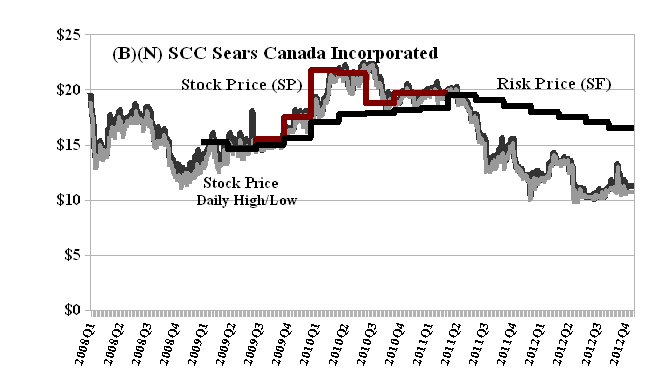 In contrast, for “consumers of risk” for whom “price is no object” and “if we have to ask, we can’t afford it”, Sears Canada has been trading in the volatility zone (N) since $20 at the end of 2011 to the current $10 and does not pay a dividend. If there weren’t at least some buyers at $10, the price could be zero but for now, at least, we’ll have to assume that the price could be anything. Sears Canada is focused on improving the lives of its customers by providing services, products and solutions that earn its trust and build relationships. It operates in two business segments: merchandising and real estate joint venture operations. Sears Canada is a multi-channel retailer with a network that includes 196 corporate stores, 273 hometown dealer stores, 12 home services showrooms, over 1,500 catalogue and online merchandise pick-up locations, 102 Sears Travel offices and a nationwide home maintenance, repair, and installation network. Until recently, Sears Canada was 95% owned by the Sears Holdings Corporation (Ilinois, USA) which has distributed – free of charge – about 50% of its holdings in Sears Canada to the shareholders of the Sears Holdings Corporation (Company press release, October 22, 2012).